Sheriff Adam Hood was shot and killed by an angry mob while transporting a prisoner to court. The mob was attempting to attack the prisoner and opened fire, killing the prisoner, Sheriff Hood, and mortally wounded Deputy Sheriff Boulware. Other deputies returned fire killing Sheriff Hood's killer and wounding several of the mobs participants. One other deputy was shot resulting in the loss of his hand. Several members of the mob were arrested. One member of the mob was charged with Deputy Boulware's murder. He was tried and acquitted. 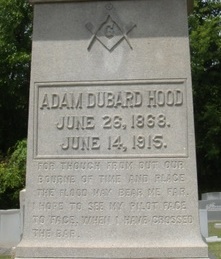 Sheriff Hood was a Freemason and was survived by his wife and is buried at the First United Methodist Cemetery in Winnsboro, South Carolina. Rest in peace Sheriff Hood.